DONETSK, Ukraine -- A reporter with a top Moscow opposition newspaper that has won numerous awards in the West was detained Tuesday in separatist eastern Ukraine and deported to Russia, his colleagues said. Novaya Gazeta has been one of the only Russian media sources to investigate Western and Kiev accusations that the Kremlin has been orchestrating and supporting the 14-month uprising in the industrial heartland of its ex-Soviet neighbour Ukraine. 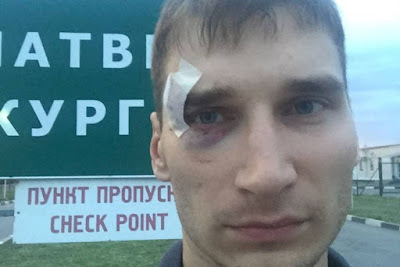 The paper wrote on its website that journalist Pavel Kanygin was detained by insurgents in their de facto capital Donetsk and taken to a separatist-controlled village on the border with Russia. "It seems like he was detained by the (rebels') state security ministry," separatist military commander Eduard Basurin told AFP by telephone. Novaya Gazeta said Kanygin was interviewed at the border by Russia's Federal Security Service (FSB) agents and would shortly be met by members of the paper's staff. "Novaya Gazeta did not want to report this while Kanygin was in Donetsk, but he was beaten during his detention," said the paper. The FSB is the domestic arm of what was once the Soviet-era KGB. Vladimir Putin -- a former spy in east Germany who headed the renamed security agency before becoming president -- has denied any Russian involvement in Ukraine. Novaya Gazeta editor Dmitry Muratov told Moscow Echo radio that Kanygin was detained by rebel security agents who accused him of "working with certain Ukrainian media". Both Moscow and Kiev -- along with the militants -- have been waging a furious public relations campaign designed to win over both global and domestic opinion to their cause. Novaya Gazeta has developed a reputation for fearless reporting about human rights abuses allegedly committed by the Kremlin and its Russian allies. Its reporter Anna Politkovskaya was shot dead in 2006 near the entrance of her Moscow apartment building after conducting a series of investigations into alleged torture by the Moscow-appointed chief of the volatile southern region of Chechnya. Both Politkovskaya and the paper itself have won awards for bravery in Europe and the United States.